Vanlife Log, day 16. Steam rises above the huge outdoor pools. People sit, and wade sporadically around the warm waters. Snow covered mountains make up the back drop in this beautiful Colorado experience. This was an epic view to take in as we soaked in the natural healing waters of these mineral springs. 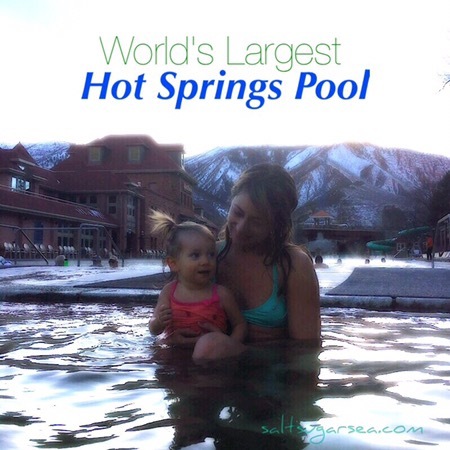 Glenwood Hot Springs claims to have the world’s largest hot springs pool, with a length of 405 feet! The large pool is a comfortable temperature of 92ish degrees. The Therapy pool is much warmer, running around 104 degrees. The actual spring, that feeds these pools, is 122 degrees. While traveling to visit family in western Colorado, we opted to take our time and enjoy this scenic route. Yes, for the enjoyment of the adventure, and also for the fact that baby isn’t pleased with more than a couple consecutive hours of sitting in her car seat. She’s been practicing her voice lately, and is very good at informing us all when she’s not pleased with a situation. The road winded in and out of mountain tunnels, following the natural flow of the river below. Not much further south than Aspen, we arrived in Glenwood Springs, CO. A pleasantly cute town, with an outdoor Hot Springs in the center of it. The Hot Springs can be seen from the road, calling tourists in as they attempt to pass through town. Glenwood Hot Springs water is fed from the Yampah Spring, which produces mineral water at a temperature of 122 degrees. “Yampah” translated from the original nomadic Ute Tribe language, means “Big Medicine”. The Native American Ute Tribe are the first people known to soak in the spring’s thereputic waters. 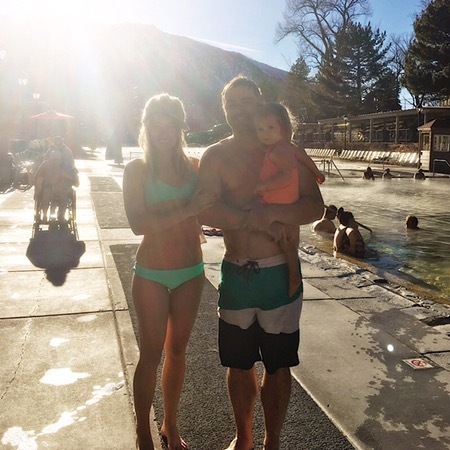 The waters are cooled before filtering into the pools of Glenwood Hot Springs. I have been cold (literally) since we arrived in the state of Colorado, and these hot springs were a very welcomed discovery. We paid the admission fee, and spent the later part of the afternoon soaking in the two pools. Do these Hot Springs Pools have a mineral smell? Glenwood hot springs pools hold 15 natural occurring minerals, (listed below) that claim to promote healing of a variety of ailments. However, unlike many hot springs, we found the sulphuric aroma at Glenwood to be very mild. The larger, cooler pool held almost no smell at all. 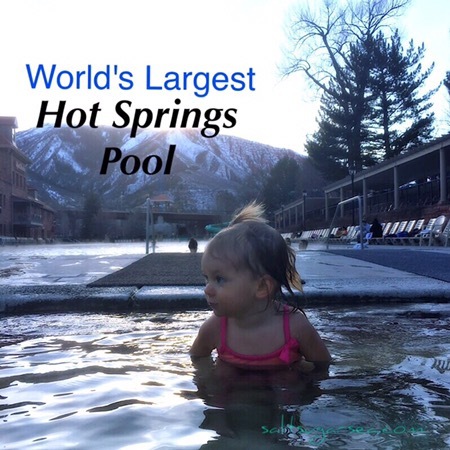 Two of the pools, including the worlds largest hot springs pool, are open year round. They open from varying morning to evening hours. Water slides, Cabañas, and a seperate kids pool are open seasonally. Admission Fee is good for all day, you can come and go as you please. If the kid pool is not open, the large pool is also perfect for kids. At a warm, but not hot, temperature of 92ish degrees, the kids can be happily warm at anytime of year. If you like history, here’s another story (and some fun pictures) that I think you’ll love!